This is a photograph from the second annual running of The Lough Lene Gaels Hurling and Camogie Clubs "New Year's Resolution Run" which was held in Collinstown, Co. Westmeath, Ireland on Sunday 12th January 2014 at 13:00. There were two races on offer today - a 10KM road race and a 5KM road race, fun run, and walk. This is one of the first road races in the midlands of the New Year. As this was a community orientated event families were especially welcome in the 5KM race. The race was organised to raise funding for the development of the GAA pitches for the Lough Lene Gaels Hurling and Camogie Clubs. Overall this was a very successful event with a very large field of well over 300 participants in both races combined. The great local effort was exemplified by a very big local contingent from Collinstown and neighbouring areas. 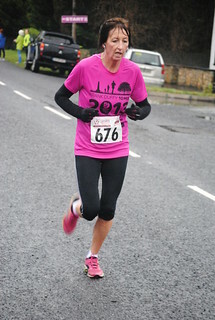 The 5KM race was an out and back course on the Collinstown to Fore Road. The 10KM was also on an out and back course with a deviation between 2KM and 7KM for the longer race. There were several tough hills but an equal amount of down-hill. The turn around on the course for the 10KM came at Doyle's Pub [goo.gl/maps/WxPSy - Google Streetview] at Glenidan. Refreshments were served afterwards in the Lough Lene Inn where the prize ceremony was also held. Note: Due to the inclement weather and poor lighting we had to, unfortunately, delete a lot of our photographs as there were very many blurs and fuzzy pictures. You will find lots more photographs and race results on the Facebook pages outlined below. Viewing this on a smartphone device? If you are viewing this Flickr set on a smartphone and you want to see the larger version(s) of this photograph then: scroll down to the bottom of this description under the photograph and click the "View info about this photo..." link. You will be brought to a new page and you should click the link "View All Sizes". Can I use these photographs directly from Flickr on my social media account? Yes - of course you can. Flickr provides several ways to share this and other photographs in this Flickr set. You can share to: email, Facebook, Pinterest, Twitter, Tumblr, LiveJournal, and Wordpress and Blogger blog sites. Your mobile, tablet, or desktop device will also offer you several different options for sharing this photo page on your social media outlets. All of the photographs posted here on this Flickr set are available free, at no cost, at full image resolution. We take these photographs as a hobby and as a contribution to the running community in Ireland. Our only "cost" is our request that if you are using these images: (1) on social media sites such as Facebook, Tumblr, Pinterest, Twitter,LinkedIn, Google+, etc or (2) other websites, blogs, web multimedia, commercial/promotional material that you must provide a link back to our Flickr page to attribute us. In summary please remember when requesting photographs from us - all we ask is for you to provide a link back to our Flickr set or Flickr pages. You will find the link above clearly outlined in the description text which accompanies this photograph. Taking these photographs and preparing them for online posting does take a significant effort and time. We are not posting photographs to Flickr for commercial reasons. If you really like what we do please spread the link around your social media, send us an email, leave a comment beside the photographs, send us a Flickr email, etc.